Carbohydrates are one of the three macronutrients, next to proteins and fats. Macronutrients are the basic components that you need in your diet. Carbohydrates, in particular, are important as they act as the most accessible source of energy for your body, powering everything from breathing to complex movements. However, carbohydrates that are not used up are stored in your body in the form of fat. This has often led to a consistently vacillating relationship with carbohydrates. Many diets, including carb cycling, aim to limit or control your carbohydrate intake. The ketogenic diet is one of the most common diets that aims to increase the amount of fat you burn while improving your general health and physical performance. Here is everything you need to know about the ketogenic diet and tips for using supplements to increase the diet’s effects. Unlike other trendy diets that seem to come and go, the ketogenic diet has existed for decades, originally beginning in the 1920s. The main tenets of the keto diet involve a strict limitation on carbohydrates while increasing consumption of fats. This can ultimately target several primary causes of weight gain, particularly hormonal, chemical imbalances and the cycle of restricting foods and binging on empty calories. The main goal of the keto diet is to change the body’s main fuel source from the glucose and sugars in carbohydrates to dietary fats by triggering the metabolic state known as ketosis. When you consume carbohydrates, your body generally breaks them down into the basic component known as glucose. Glucose is a sugar and the easiest molecule for your body to break down into energy. In fact, your body will prioritize glucose (as long as it is available) over any other energy source. Your body also creates insulin as a response to a rise in blood sugar after eating. Most of your cells can’t take in glucose directly. Insulin acts as a key that unlocks cells, allowing glucose to enter and be used as energy. Insulin also acts as the chemical that signals when leftover glucose should be stored as fat. In a normal diet, your body has plenty of carbohydrates to use for immediate energy, meaning that it rarely needs to dip into fat stores. However, the ketogenic diet drastically lowers the intake of carbohydrates you take in, which puts your body in a state of ketosis. 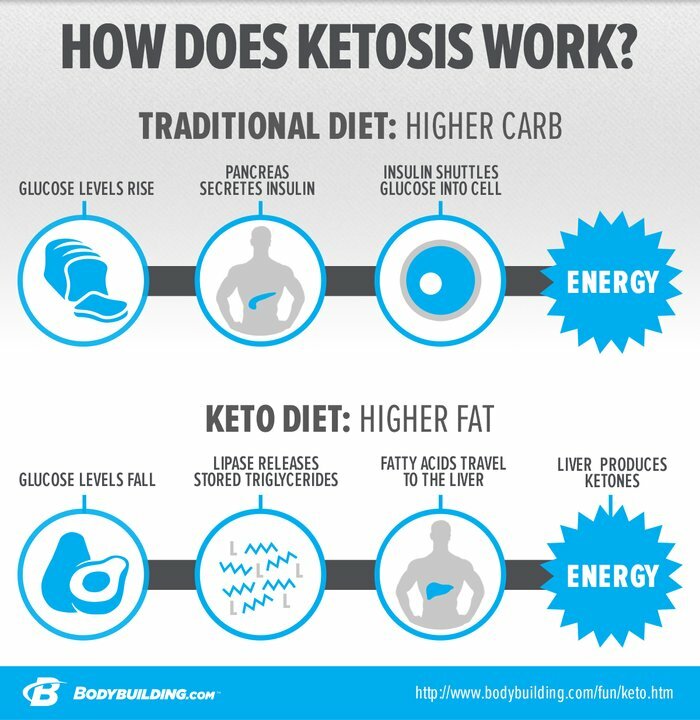 Ketosis is a natural process designed to help humans survive when carbs and food in general is scarce. During this metabolic state, your body becomes much more efficient at burning fat for energy. The liver breaks down fats into glycerol and fatty acids in a process called beta-oxidation. Through this process, the liver produces a water-soluble compound known as a ketone. Ketones come in three main types: acetone, acetoacetate, and beta-hydroxybutyrate. These are used as a source of energy for your body and brain much like glucose. Where other diets work by limiting calories, the ketogenic diet requires that you still need to meet your body’s daily calorie needs. In other words, instead of starving calories, you need to starve carbohydrates. The standard ketogenic diet (SKD) – This diet focuses on very low carbohydrates, high fats, and a moderate amount of proteins. The general ratio for the standard ketogenic diet is about 75 percent fats, 20 percent protein, and 5 percent carbs. The high protein ketogenic diet – This is a modified form of the standard keto diet that incorporates more protein. The ratio is adjusted to about 60 percent fat, 35 percent protein, and 5 percent carbohydrates. The cyclical ketogenic diet (CKD) – The cyclical ketogenic diet is related to carb cycling and allows for certain periods of higher carbs around periods of low carbs. For example, the most common form of cyclical ketogenic diet allows for two days of high carbs and five days of your standard ketogenic diet. The targeted ketogenic diet (TKD) – The targeted ketogenic diet acts as a compromise between SKD and CKD by allowing you to consume carbs around your workout times. This ensures that you have the extra amount of energy necessary to push you through your exercise. The standard and high protein ketogenic diets have been studied more extensively for their effects and benefits, while the targeted and cyclical ketogenic diets represent more advanced forms of the diet that are generally better used by bodybuilders and athletes. Regulate blood sugar levels – Studies show that the ketogenic diet can effectively help you manage your blood sugar levels. This can help you prevent diabetes, but if you have type II diabetes or are considered pre-diabetic, the keto diet can help you control your blood sugar and stay healthy. Increase physical energy – Studies suggest that fat is more efficient to burn as fuel, giving you a better, more reliable source of energy. Improve mental focus – Ketones have been shown to provide the brain with a great source of fuel. Fewer carbs also prevents sudden spikes or dips in blood sugar. By combining both of these factors, the ketogenic diet can potentially result in greater focus and concentration and improved mental function. Control cholesterol and blood pressure – Research shows that the keto diet can reduce bad cholesterol and triglyceride levels associated with buildup in your arteries. These symptoms should only last up to two weeks and will go away as your body gets used to the new diet. Often the best way to prevent these symptoms is to stay hydrated (drink at least a gallon of water a day) and to eat foods high in the vitamins, minerals, and other micronutrients that your body craves. Supplements can help combat the keto flu and other side effects while also maximizing the diet’s benefits. Pyroxamine™ and Thyrovate™ from MYOKEM™ acts as a powerful thermogenic agent that help to boost your metabolism while suppressing your appetite, improving your focus, and providing a smooth, clean flow of energy. To ensure that you get plenty of essential amino acids, consider supplementing with mTOR Pro™, which can increase performance, hydration, and amino acid absorption while providing 10.5 grams of essential amino acids in every serving. The keto diet offers an effective means of losing and controlling your weight, on top of several other benefits. Consider making the switch to this new diet to help improve your performance in and out of the gym.